Interviewing bands as a fan or as a journalist is all well and good but there's only so much insight a 'critic' has. Musicians are like a totally different breed and if we've learnt one thing from our takeover weeks, it's that musicians talking to each other is incredibly illuminating. We're yet to come up with a great title for this new feature (Artist-on-Artist, Peer-to-Peer, Muso-mush...) but the concept of getting musicians we like to interview each other is a definite goer. So far, we've have Catherine AD picking Tori Amos's brains and Ed Droste from Grizzly Bear chatting to Phoenix via Skype. For the third instalment of Artist 'n' Artist, former Les Incompétents and current Ox.Eagle.Lion.Man man Frederick Blood-Royale meets former At The Drive-In and current Mars Volta spearhead, Cedric Bixler Zavala. Distant PR person voice: Cedric meet Frederick...Frederick meet Cedric. FBR: Obviously the first thing to bring up, is that having listened to Octahedron a few times, it's clearly a pretty big departure from Bedlam. Lighter, more straightforward, more commercial. What's the idea behind the record? Cedric Bixler-Zavala: We wanted to make the opposite of all the records we've done. All along we've threatened people that we'd make a pop record, and now we have. FBR: Something deliberately more accessible? CBZ: Well, just for us really. The first song was something that was meant to end up on Bedlam, but I guess it didn't fit. What we wanted to make was an acoustic album. So this is our version of that, but obviously not sticking to the rules. It's always good to get rid of one audience to gain another. The old audience always knows what to expect. And I'm sure whatever audience comes from this album, we'll disappoint them with the next record. FBR: So you want a challenge for the fans who only want twenty minute guitar solos and no choruses? CBZ: We did have choruses before, just the libraries of music in people's heads are so undeveloped that their ideas of choruses are training wheels and the Bay City Rollers. FBR: In terms of your career as a whole, is this going to be as 'pop' as The Mars Volta ever get? CBZ: Yeah exactly, so if anyone's bummed that The Mars Volta record's too simple or too pop, they can buy that album and it'll take them right back to that kind of sound. It's one of my favourite things I've ever worked on. It's pretty much a Mars Volta record, just without Thomas, Ikey, and Marcel. With Volta [Octahedron] was just our acoustic record that turned into our pop record. FBR: And is it a concept record? FBR: Surely there imagery that stuck in your mind throughout the lyric writing process? CBZ:...kidnappings, vanishings, 'what if' scenarios about how to get Republicans out of the White House if they'd got in. FBR: What have you been listening to that influenced it? CBZ: A lot of Scott Walker ballads, ballads from Roky Erickson and the Raspberries. FBR: Your lyrical vocabulary seems a lot more down to earth too. CBZ: Yeah, probably. But you think I'm saying something and then you read the actual lyric and realise it's pretty bent out of shape. What people need to understand is that we've been doing this for almost ten years now and everything we do is just our way of making things interesting for the band. FBR: Looking at the number of solo albums Omar makes, he's clearly constantly writing. In terms of songs, how does he differentiate what's for one of his own records and what's for the band? CBZ: Some stuff he just feels passionately about, and that's for Volta. Or I'll stick my head around the door and ask if we can use something for the band. FBR: And can we expect a Cedric solo album any time soon? CBZ: Yeah, there's a lot of music that's ready. I just need to get around to singing on all of it. I've been working a lot with a friend of mine called Deantoni Parks, a drummer who's spent time with like, Tom Waits and John Cale. He plays in this band Kudu who are pretty much a modern version of Vanity Sticks, and he toured with Volta for a while. Omar's made a couple of electronic records with him. He's known as like the live drummer that can sound like a machine. FBR: There's that sort of electronic sound that comes through subtly on Octahedron, especially on tracks like 'Copernicus'...an almost '90s Warp vibe in parts. Can we expect more of that on future Mars Volta stuff? CBZ: Yeah, I'd definitely push for more of that. FBR: Have you got any current musical recommendations for Drowned In Sound readers? CBZ: I dunno, I've just been really into my ballads...and anything that ends up in murder, somehow. You've got to take the love story down that road. A lot of time that's just how it ends up... [laughter]. And I like a lot of dancehall, except the homophobic element of it. I mean, I love to dance to it, but I can't dance when the hypocrisy of the statement 'one love' excludes certain types of people. FBR: What about the live shows for this record? Are they going to be lighter too? CBZ: I reckon we'll play the majority of the record and then we'll probably end the set with some of the older stuff that we can include improvisation on. I think the game plan is to play all the new stuff as individual songs, unless something opens up and we recognise it as a spot to fool around with. FBR: And after almost ten years in the band, do you think it'll be going for another ten? CBZ: Yeah definitely, especially being around the people in the band right now just excites me. Plus, to have as much time off as we've had from it... it's a good break to remind you what you love doing. I love it and I'll always love it. It's the one outlet I have that won't get me arrested or get me in trouble. I can get away with it. I don't know if I could collaborate with many other people. The closest thing I've found to like-minded people is when we curated ATP. FBR: They'll probably be up for paying you a lot to reform 'At The Drive-In', like they did with Sleep at few weekends ago. FBR: But I take it you probably won't be accepting any offers on that front any time soon? CBZ: I don't know what to say about that really. We've been making amends with a lot of the members and having some really good talks with them. And we've been trying to get our financial business in order because a lot of people have been ripping off that band really badly... as far as the business side goes. I wouldn't mind it. Y'know, it might happen, we just have to iron out a lot of personal things. A lot of it we've dealt with already and I've apologised for a lot of things I've said and the way it ended... we'll see what happens. 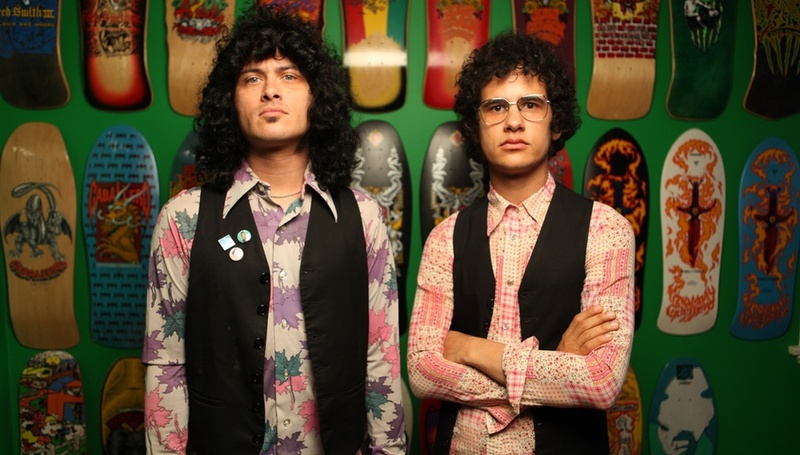 The Mars Volta's fifth studio album, Octahedron is out on June 22 through Mercury. They also play live at the ICA, London on June 18 and return to play Somerset House on July 13.